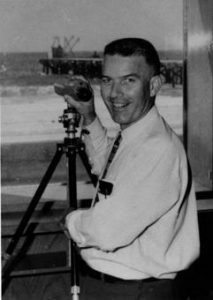 In recognition that 2016 marks the 50th Anniversary of Moss Landing Marine Laboratories . 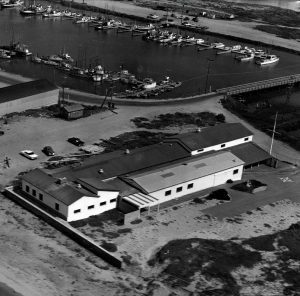 Moss Landing Marine Laboratories (MLML) was conceived by professors at San Jose State College in the early 1960s, and in December 1965 the facility was purchased for $210,000 from the Beaudette Foundation for Biological Research (Fig. 1). The MLML consortium initially included the California State College campuses from San Jose, San Francisco, and Hayward (now East Bay), each contributing $20,000, which along with a grant from NSF for $150,000 provided the purchase price for the property. Almost immediately the campuses from Sacramento and Fresno joined the consortium. Figure 1. The Beaudette Foundation building, photographed in 1965, became the first MLML facility. The future volleyball court is conspicuously missing at that time. Dr. John Harville (Fig. 2) became the first Director, and under his leadership the Policy Board established curriculum, staffing, and operating policies. Figure 2. John Harville, the first Director of MLML, photographed in the old library. James Nybakken (CSC Hayward) was the first permanent faculty member joining Harville to teach the inaugural classes at MLML in Spring 1966. The first complete set of courses was offered in Fall 1966, when Oceanography, Vertebrate Zoology, Invertebrate Zoology, Marine Ecology, Literature of Marine Science, Research, and Algology were taught. We now realize that algology is an incorrect use of the word because it refers to the study of pain, and that phycology is the correct terminology (for which I am reminded by Drs. Foster and Graham all the time). Fourteen students attended the Fall 1966 classes, they came from the campuses of Hayward and San Jose (Fig. 3). By Spring 1968, there were 55 enrolled students, 30 of them graduate students, representing all five of the consortium campuses. Figure 3. Some of the attendants of the MLML dedication in 1967. The official dedication of MLML occurred on 28 April 1967, and was attended by 250 invited guests and the MLML community. Lieutenant Governor Robert Finch delivered the dedication address and Chancellor Glenn Dumke provided introductions. 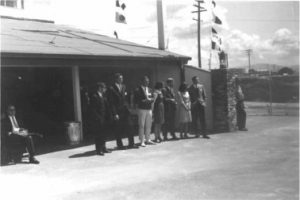 The following day approximately 500 persons attended the first MLML Open House, establishing a tradition that continues today. Much of this information was taken from the History of Moss Landing Marine Laboratories: The Early Years by James Nybakken. 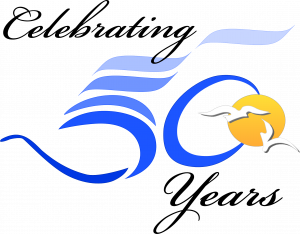 This blog will be one of many, posted once a week until August 2016, as we celebrate 50 years of excellence in marine science and education at MLML.